When it comes to getting organize, we all panic. Sometimes the very thought of the task can seem overwhelming and daunting. Most experts agree that when you want to tackle a large project, start with simple steps. Remember the old saying, “How do you eat an elephant? One bite at a time”. For your home a great place to start is organizing your bathroom closet or countertop. Lets reduce that task to a even a more manageable step, beginning with your makeup. Let’s face it – beauty products are not inexpensive so keeping them preserved is important. In addition the steps you take now to organize your products will help you save time in the long run. Our Cosmetic Carousel is a new and innovative design. 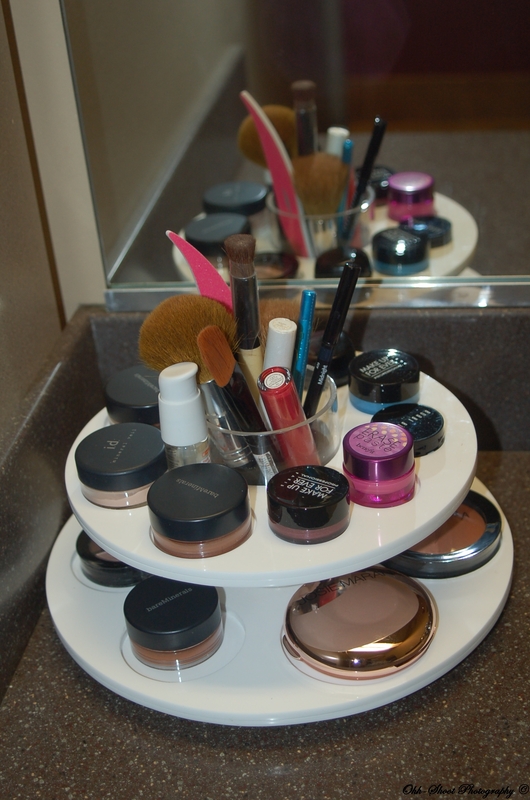 Instead of just moving your cluttered items from a messy, unorganized drawer to a metal, bulky, and disorganized container, our revolving carousel is lightweight and extremely durable that will separate your beauty products and accessories neatly and effectively. 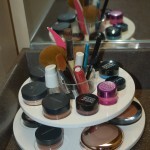 The Cosmetic Carousel is a two-leveled organizer with round holders engraved into the material. This allows you to place more of your items on the carousel without worrying about them falling over and breaking. The Cosmetic Carousel also has a neat and convenient cylinder in the middle of the two levels, handy for holding your brushes, keeping them separated and less contaminated. The center cylinder can also be used for hairbrushes, combs, and any other items otherwise lost in your drawers or lying on your counter tops. The Carousel is available in two sizes: small and large. The primary difference between the two products is the small Cosmetic Carousel is better suited for smaller items, where as the large Carousel is perfect for those who own larger products and need the extra space to hold them. In addition to the Cosmetic Carousel, we offer a Nail Polish Carousel. This product is manufactured in small, medium and large. The small Nail Polish Carousel can hold up to 24 nail polish size items in total. All United Products, LLC items are made of highly durable acrylic plastic. Standard colors are white and black, however custom coloring and designs are available by contacting us.